Juneau Chapter No. 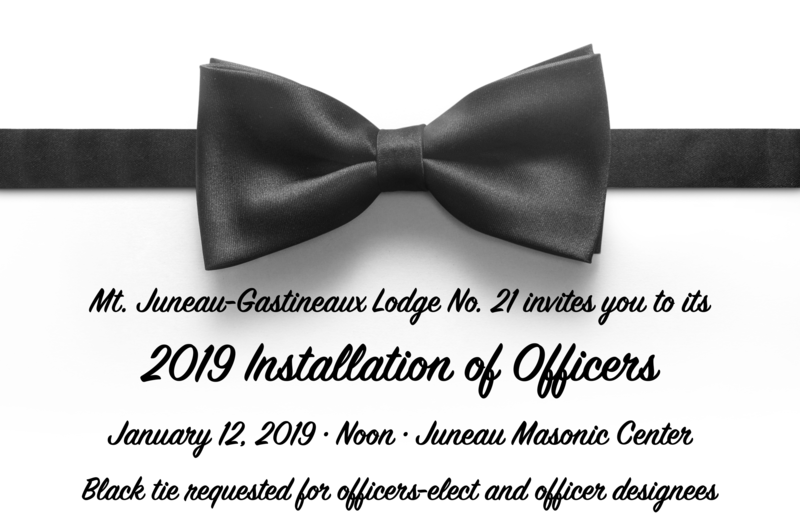 7, Order of the Eastern Star will install its officers at 4 p.m. on Jan. 5, 2019 at the Juneau Masonic Center. Meanwhile, Worshipful Master-elect Ronald James Robinson invites you to Mt. Juneau-Gastineaux Lodge No. 21’s installation of its 2019 officers. Officers-elect and officer designates of Mt. Juneau-Gastineau Lodge No. 21 are requested to wear black tie or a dark business suit. A luncheon and reception will follow the Lodge’s installation. Please RSVP to mtjg21@gmail.com or by calling (855) 305-0155.